The probability of an event is the subjective chance that it will happen. The laws of probability are heavily build with the random notion. A probability is a non-negative number between 0 and 100%. To verify the the result, you can simulate the event through the creation of a script. The probability of you being born was about 1 in 400 trillion. If the probability of an event is 3/5, the odds are 3/2. If the events are independent, we can multiply each probability. Two events are independent when the outcome of the first event does not influence the outcome of the second event. Example: Probability to choose 2 red cards in a deck of 52 cards. Exclusive events cannot happen at the same time. wheel of fortune, only one field can be chosen. The chance to go the field 1 or 2. Inclusive events can happen at the same time. Example: What is the probability of drawing a black card or a ten in a deck of cards? This probability is inclusive because you can have in one event the two possibles outcomes. For the frequentist a hypothesis is a proposition (which must be either true or false), so that the frequentist probability of a hypothesis is either one or zero. In Bayesian statistics, a probability can be assigned to a hypothesis that can differ from 0 or 1 if the true value is uncertain. What is evidential probability ? A coin is tossed repeatedly many times, in such a way that its probability of landing heads is the same on each toss, and the outcomes are probabilistically independent, then the relative frequency of heads will (with high probability) be close to the probability of heads on each single toss. This law suggests that stable long-run frequencies are a manifestation of invariant single-case probabilities. 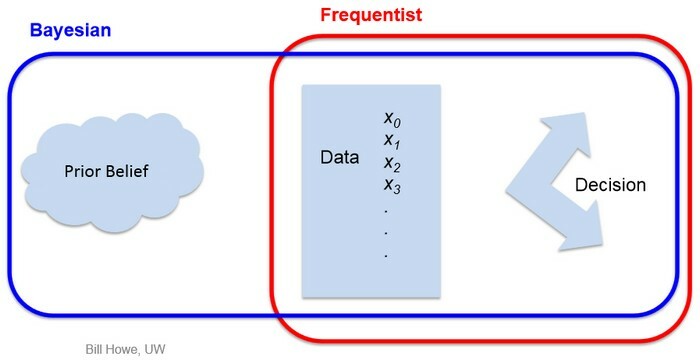 Frequentists are unable to take this approach, since relative frequencies do not exist for single tosses of a coin, but only for large ensembles or collectives. Hence, these single-case probabilities are known as propensities or chances.